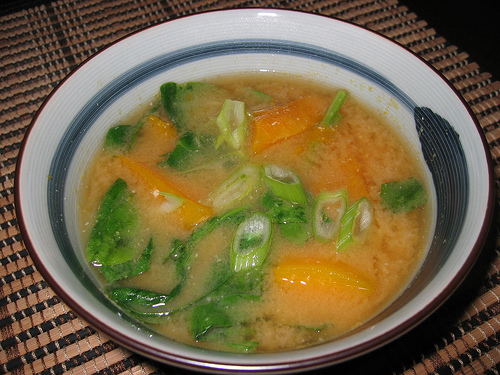 Continuing with the kabocha theme this week I had kabocha miso soup for breakfast each morning. The kabocha was simmered in the dashi until tender. It was pretty good and I tried it in a number of ways. I tried swapping the spinach out for wakame. I also tried adding a spoonful of kabocha pumpkin puree to the soup to add some oven roasted flavour. Bring the dashi and kabocha to a boil in a small sauce pan. Reduce the heat and simmer until the kabocha is tender. Remove from heat and add the spinach. kevin, I have just found your blog, i’ve been reading, and drooling, for the last 30 minutes. I just want to say nice work. thanks for putting it out there. Kabocha is a winter squash also known as a Japanese pumpkin. @ Cynthia: Kabocha is a wonderful little green-skinned Japanese pumpkiny thing, sweeter than almost any kind of winter squash I know. Search for “kabocha” at flickr.com and you’ll find plenty of pictures. BTW, Kevin, thank you for posting this recipe. I had selected an overambitious recipe for next week’s bento lunches, and this simple recipe will make a great substitute. I’ll just precook the kabocha and assemble all the ingredients to be mixed with instant dashi at lunchtime. Can’t wait!